The refinery ISO OCTANE in Dubai, UAE is a rather small refinery. This refinery is not operating constantly, but is used only batch-wise. Due to this mode of operation, also the cooling loop is not running in full capacity all the time. The cooling loop is operated with limited water circulation, if there is no production in the refinery. During inspection of the cooling water system, there was found heavy fouling, caused mainly by organic material. This is called biofilm caused by biofouling. 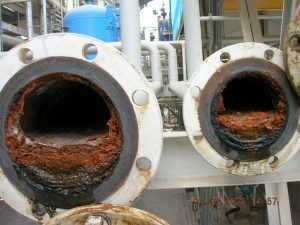 This fouling could be found in the entire system, this means all pipes, valves, cooling tower and heat exchanger. lm is they might house bacteria, which might cause MIC – corrosion caused by microorganism. Adding chemicals or working with heat is a possibility to solve the problem. But only in the parts of a water system, where water is always flowing. In a dead leg adding chemicals or using UV-light is not solving the problem at all. The stagnating water is an ideal habitat of these bacteria and the chemicals can’t reach those areas as the water doesn’t cycle there. In the return line of the cooling loop, so called biocide was added in the water to stop the growth of algae. Nevertheless heavy growing of algae was found at the cooling tower. These algae were distributed by the water through the entire system. 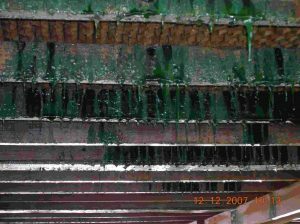 The biofouling or biofilm is forming a slimy film at the inner surfaces of the pipes. This film is reducing the heat transfer significantly and so the cooling was not sufficient anymore. different strategic locations throughout the cooling water loop. This ensures maximum results with litte investment for the customer. 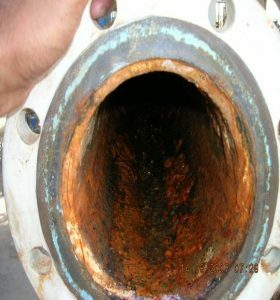 Within the scope of the first phase the cooling loop was running with full capacity to get the system cleaned by flushing out existing deposits. Two months later the spots we previously checked were opened again to see the results. It was clearly visible, that the existing fouling had vanished. The inner surfaces of the pipes started to get clean. Even old corrosion could be removed gradually. The rust is taken downstream and will settle in the sump of the cooling tower. It can not be said how long it takes until all the corrosion is gone because this depends on many factors. The corrosion rate has been in average 8.5 mpy before the Merus installation and could be lowered to less than 1.5 mpy in two months.